Navratri is a festival of change, both the Chaitra Navratri and Shardiya Navratri come at the change of seasons. It is a good time to reboot our systems, and breaking away from regular daily foods is a great way to do so. 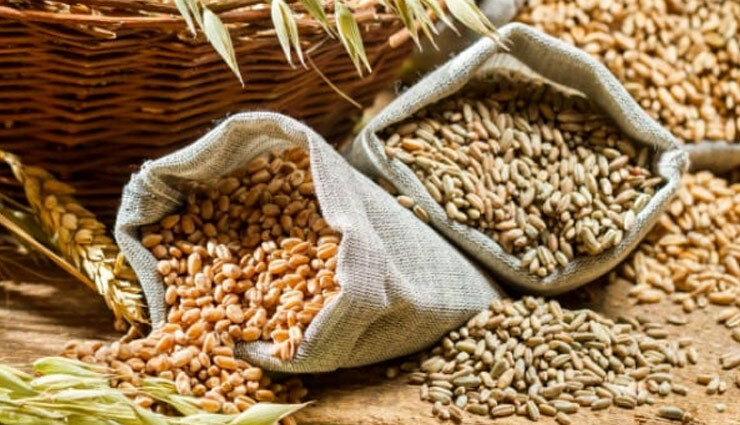 Grains allowed during Navratri fasts include Kuttu (also called Buckwheat), Singhara, Samai, Amaranth and Quinoa; all nutrient powerhouses and most importantly, all gluten-free. In today's world, when our diets are gluten-heavy, these 9 days can bring a much needed relief to our system while also nourishing it. I firmly believe our fore fathers were well aware of the tenets of healthy living and they used a variety of practices to teach and inculcate such habits. Observing fasts during change of season, when our immunity is likely to take a hit, is a good practice to keep the digestive system healthy. Buckwheat is probably the most popular and extensively used cereal associated with Navratri fasts. Its nutritional profile is amazing - its got good quality proteins, phosphorus, magnesium and fibre. It also contains vitamins like Riboflavin, Thiamine, B6, Folate, antioxidants and, to top it all, a low glycaemic index of 49-51. Phosphorus is essential for energy utilization and muscle contractions. The fibre present in buckwheat is soluble, insoluble and resistant starch giving the body maximum benefit by its cholesterol lowering effect and providing pre biotics for a healthy gut. Rutin, a flavonoid present in buckwheat, is associated with lowering both BP and LDL (bad cholesterol) concentration. Its amino acid profile helps add proteins to our food at a time when we avoid all non-vegetarian protein sources. Being gluten-free makes it light on the tummy and great for digestion. Singhara, known as Water chestnut, buffalo nut or bat nut is the single seed of the fruit of a floating aquatic plant. The health benefits it brings to your meals include good protein, phosphorus, fibre. It provides 110 micrograms of folate/100gm, and we all know how important it is for pregnant mothers and for protection against anaemias. Its antioxidant and anti-inflammatory properties are well-documented. Research has shown that polyphenols present in Singhara are strong scavengers of free radicals in our body. Green and red variety of singhara have also shown anti-bacterial activity. Being rich in Potassium and low in Sodium, it is said to help with water retention too. The first benefit of eating this pseudo cereal is its Protein content. Amaranth has the highest amount of protein amongst all other cereals. It also contains an amino acid called Lysine which is missing from other cereals, making it a complete protein source. Phytosterols present in Amaranth help lower cholesterol. Amaranth is also a rich source of Calcium and Iron providing our body with two of the most essential nutrients. 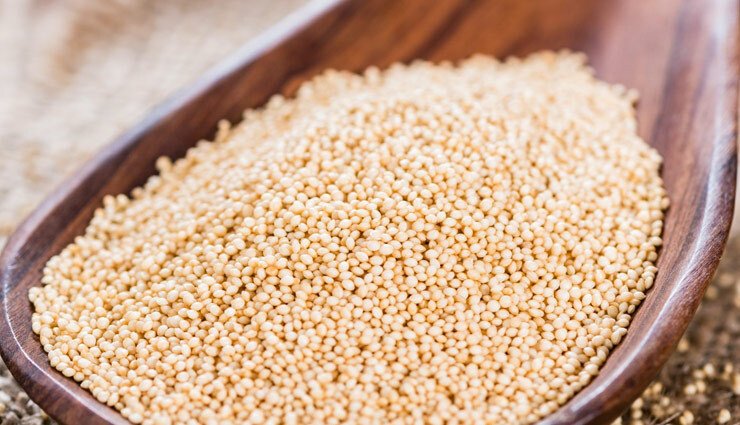 The fibre content of amaranth helps aid digestive health while lowering cholesterol and controlling BP. Its antioxidant cache contains Gallic acid, p-hydroxybenzoic acid and vanillic acid - all of which are known to protect against cancers and heart diseases. The little millet, as it is commonly known is as nutritious as the other Navratri cereals. It has the highest fibre content among all the cereal grains. Fibre is known to be protective against Diabetes, cardiac diseases, and aids digestive health. By adding bulk it promotes early satiety and prevents over eating. The phenolic compounds of Samai provide antioxidant benefits to our body. The iron content of Samai is high and a single 30g serving can provide 16% of the day's requirement for an adult man. Being gluten-free makes it easy to digest and is relaxing for a digestive tract overloaded with gluten. Another fabulous feature of samai is that it does not demand much from the soil and grows well in drought-ridden and poor quality soils as well, while returning so much through its health benefits. Quinoa is actually a seed and is referred to as a pseudo cereal, making it an interesting choice for Navratri meals. It is a rich source of quality Proteins containing all 9 essential amino acids, fibre, phosphorus and folate. It is also naturally cholesterol-free and gluten-free. Quinoa is often referred to as a powerhouse of antioxidants and rightly so, as it is a good source of Vitamin E and phytochemicals and flavonoid. Flavonoid quercetin present in this grain is associated with anti-bacterial, anti-inflammatory and strong anti-viral activity. With 7gms of fibre/100g it leaves behind other whole grains, coupled with a low GI it is a grain of choice for diabetics and weight watchers alike. These 9 days of fasting also give us a break from our gluten heavy daily meals and as quinoa is gluten free it's a great way to rest your system.